Ballooning has a very long history in Meadville. The Thurstons were a Meadville family who were involved with ballooning in the 19th and early 20th centuries. Samuel Sylvester Thurston was born in 1834, and operated a hotel in Meadville. In 1860, Samuel learned how to fly from noted balloonist, Professor Steiner, and purchased a balloon. Townspeople were skeptical, but over the next 25 years, Samuel made 215 ascensions in his balloon. He enjoyed sharing his unusual sport with others, flying without charge at fairs, exhibitions, and 4th of July celebrations. Following in the footsteps of his father, Alic Thurston began ballooning in 1889. His first public ascension in 1891 abruptly ended when his balloon caught on the wiring of the newly-installed street lights of Meadville and never took off. Alic later built a number of balloons, including one that he christened the “Meadville”. The Meadville was constructed of 576 yards of muslin, and stood 64 feet high. It had a volume of 35,000 feet, which is only half the size of a model ern sport hot-air balloon, but comparable to the gas balloons still flown in competition today. Alic had a variety of adventures during his career as a balloonist. His grappling hook, a crude landing device employed by early balloonists, ripped a chicken coop from its foundation, as his father Samuel had earlier torn the roof off of a farmer’s kitchen. On one occasion, he flew his balloon 180 miles to a landing in the forest near Emporium, Pennsylvania and had to return home by train. On another flight, he was becalmed at night over a lake. On at least one occasion, he launched his balloon from the roof of the Market House in downtown Meadville. Both Samuel and Alic Thurston used the title of “Professor”, a title conferred by early aeronauts on themselves to convince the public that ballooning was a scientific and learner pursuit. Their ascensions attracted thousands of spectators and were followed closely in the newspapers of the time, the notion of people flying through the air was still very newsworthy in those days. In 1988 a group of volunteers decided to commemorate the daring feats of the Thurston’s during the Meadville Bicentennial celebration. 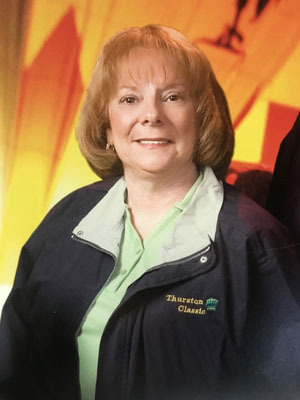 Joyce Stevens started with the Thurston Classic in the first year of its existence, Meadville’s Bicentennial year of 1988. She worked with Ted Watts as a paralegal, so it was instinct for him to get his go-to employee to take over the huge job of matching up pilots and official observers. That job cascaded into more and different duties during that weekend. None of us was very sure of what we were doing in that first year but Joyce helped make it happen. She was a major reason for our success. Since then, Joyce proved herself to be the centerpiece of the Thurston. Year after year, the Thurston has gone on without missing a beat and it was all because of Joyce. Even we on the committee did not realize how much work she poured into the Thurston and we are still trying to catch up. Sadly, she passed away in March of 2017, too quickly. It was a shock to all of us. We miss our friend and our partner. We are continuing to honor Joyce for all of her many years being the soul of the Thurston Classic. We will never be able to replace her and all we are left with is honoring her memory annually with the Joyce Stevens Memorial Night Glow. Hopefully, somehow she will be able to see the Thurston take flight once again and hopefully she will know how much she is missed.